Shortage of pigs and rising costs of feed and labor fuel the momentum, report Hu Yongqi in Shandong province and Li Jiabao in Beijing. W ang Yugui, a farmer in Zibo, Shandong province, has not seen pork prices this high since he started raising pigs in 2001. When pork hit a record 18.4 yuan ($2.83) a kilogram this month, nearly twice the March 2010 price, Wang decided to sell the 10 pigs he had that weighed more than 100 kg, the market minimum. However, 60 of his pigs are still underweight. Like more than 1,000 other pig farmers in Zibo, the 50-year-old must wait and risk missing out on turning a profit. "I hope all our pigs grow to 100 kg so I can sell them at peak price." There's no way to speed the fattening-up process, but Wang's luck might just hold. 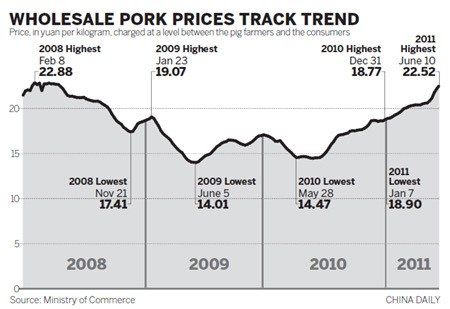 Some experts expect pork prices will keep going up for the rest of the year. Good news for those who raise pigs, not for those who buy pork at the grocery store. "The price increase is a reflection of the pig growth period," said Zhu Baoliang, deputy director of the economic forecasting department at the State Information Center. "It takes about a year and a half for the price to reach the peak from the bottom. "The price touched bottom in July and then began to pick up. It will keep going up before the next pigs are fattened in six or eight months." Li Yongqiang is more patient about selling his pigs. He is 62 and has been farming pigs for 21 years. "If I stock the pigs for one more week, each pig will bring me another 100 yuan." Li sold more than 400 pigs last Thursday. Then he learned that the price has edged up 0.1 yuan a day since early June. 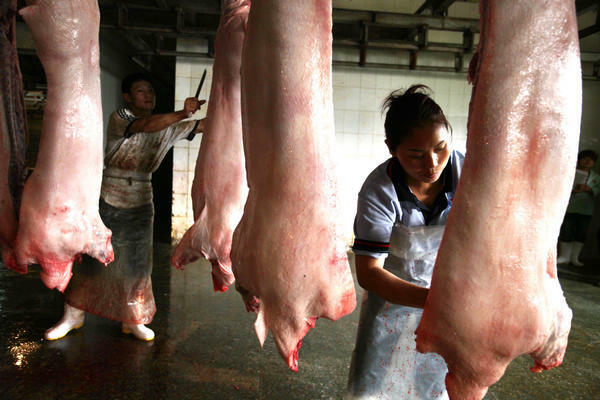 A one-week delay in selling his pigs could bring Li 1 or 1.2 yuan more for each kilogram. Li keeps about 6,000 pigs in his breeding farm in Dasungezhuang village in Beijing's Shunyi district. A shortage of stock and rising feed and labor costs are chiefly responsible for the increase in the market price for pigs. Shandong farmers raised 40 million pigs last year, 1 million of them in Zibo. This year, however, the number of pigs in the city has dropped to about 950,000, said Xue Lequan, deputy director of the city livestock bureau's production division. Farmers reckon the cost of raising a pig to market is 8 yuan a kg. When the price dropped from 13 yuan in 2009 to 9.6 last year, many growers stopped breeding pigs and sought city jobs. In Wang's village, 17 families left pig breeding behind last year. Only seven are still in business. They are raising 1,200 pigs this year, which is 1,700 fewer than last year, Wang Shunlin said. He owns the biggest pigpen in the village, accommodating 600 heads. Farmers fear disease most. Last winter was warmer than normal, and more bacteria survived. Many sows fell ill and fewer piglets were born. Five of the 10 sows in Wang Yugui's pen failed to get pregnant because of disease, and he lost 40 piglets. "Corn accounts for 60 percent of pig feed" and its price is up 30 percent from April 2008, said Feng Yonghui, chief analyst of Soozhu.com, an online pig market monitoring and analysis service. "It reached a record high in March this year before the price of pigs and pork did." Li, the Beijing pig farmer, thinks that in the background of inflation, the price of corn is acceptable if it stays below 3 yuan a kg. Still, even if farmers are getting more for their pigs at market, the extra they spend on fodder narrows their profit margin. Each pig consumes 250 kg of corn in the six months or so from birth to market. Corn, which sold for 1.6 yuan a kg in 2005, now costs 2.3 yuan a kg. It means Wang Yugui spends 12,250 yuan more on corn. Labor costs are up too, "by at least 20 percent from last year", Feng said. "Migrant workers now earn 2,500 yuan or 3,000 yuan a month and their monthly wage was about 2,000 yuan last year." And it's not just the wages that are a problem, Li said. "I now pay the keepers 100 yuan a day, though I paid them 5 yuan a day in the past years. But if I were to offer 100,000 yuan a year, I would still have trouble hiring a breeding technician because few college graduates are willing to work in the hot, dirty pigsties with no breaks."